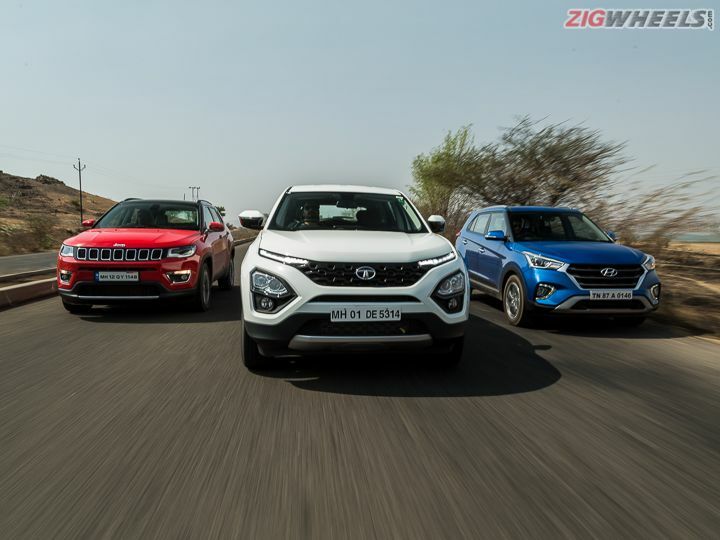 The Hyundai Creta and Jeep Compass aren’t exactly direct rivals, are they? The prices of the Creta end where the Jeep's start. One is a car that offers a sedan's ease of use with all the appeal and packaging of an SUV, while the other is a proper SUV that offers a more premium experience too. But what if you want a bit of both worlds? An SUV that's as convenient to live with everyday as a sedan, but robust enough to deal with the rough stuff and give you that sense of authority on the road. Is the Tata Harrier that perfect balance? If you had your sights on the Hyundai Creta, should you choose the Harrier instead, for a more authentic SUV experience? And, if you were eyeing the Jeep Compass, is the Harrier a compromise for the money you save? The Harrier doesn’t play it safe with its looks, but it’s one of the most distinctive designs you will see on Indian roads. The DRLs would make Tony Stark’s eyes light up and xenon projector headlights add to the dazzle. The design of the 17-inch wheels though is a touch too sober when compared to the rest of the car. But viewed from the side, the Harrier, which shares its platform with the Land Rover Discovery Sport, bears some resemblance with the Range Rover Velar. It’s also very Velar-like at the rear with the connected look of the tail lights. What stands out the most though, is the sheer size of the Harrier. It’s over 200mm longer than the Compass and over 300mm longer than the Creta. Even its wheelbase is significantly larger than that of the other two. But on-paper dimensions be damned. Just place the Harrier next to its rivals and you wonder how they’re in the same price space. We all have family members who equate higher price to bigger size and in that department, the Harrier will easily get the seal of approval from them. Of course, it’s not surprising that the Harrier is Obelix in this competition since it’s based on a Rs 50 lakh SUV. If it’s a battle of size, it’d be best if Asterix just stayed indoors lest Goliath trample him. In comparison, the Creta plays it safe. The smaller proportions are combined with a more universally likeable design and it also looks sportier. The 17-inch alloys look sweet and it packs in goodies like halogen projector headlights, sort of aftermarket-ish looking DRLs and like the Harrier, LED tail lights. The Compass, though, has the most balanced and old school look of the lot. The 18-inch alloys of the Limited Plus make the stance meatier, while the projector headlights sport a bi-xenon setup. At the same time, the boxy styling, flat face and bumper-integrated indicators add some retro charm. So, the Compass doesn’t inspire superlatives like the Harrier, but isn’t as subdued as the Creta either. Of course, all these SUVs are appealing to you in their own way, but how do they try and appeal to the family? Now, all these cars can seat four adults upto 6ft in height quite comfortably. Plonk in four adults in the Creta or the Compass, and there’s adequate rear knee room, foot room and at least, in the Creta, headroom too. Rear headroom is just about enough for a 6-footer in the Compass Limited Plus, simply because the sunroof eats into the available space. This isn’t an issue in the other variants. But at 6ft 5in, yours truly isn’t indicative of the vast majority of the Indian population. This is also why, on the ZigWheels YouTube channel, you will often find me using my more appropriately proportioned colleagues as in-cabin size references. But that changes in the Harrier, as it is possible to fit a 6ft 5in passenger behind a driver of the same height. Additionally, the Harrier’s cabin, even with this dark palette, feels the airiest and while all three cars here are labelled five-seaters, only the Harrier truly delivers on that promise, even if the passengers are plus sized. At 1400mm, the shoulder room in the Harrier is a full 150mm more than the Creta and 55mm more than the Compass. Even the rear seat base width is larger in the Harrier’s, while the minimum kneeroom is a big leap higher as well. The Creta’s boot size is par for the course. At 402 litres, there’s enough for the family’s weekend road trips and the rear seat folds down as well. However, the Compass and Harrier do better. On paper, the Jeep Compass (438 litres) has the larger boot, but it also has intrusive wheel arch bulges meaning the usable space is actually better in the 425-litre boot of the Harrier. All these cars are plus-sized with their features lists too. Passive keyless entry with push-button start, auto AC with rear AC vents, leatherette upholstery, rear cameras with dynamic guidelines and rear parking sensors are common to all of them. However, an interesting observation is how each car manages to top the others’ kit in their own way. The Harrier gets a 7-inch TFT driver information display that even gives you turn-by-turn navigation instructions. That aside, it offers puddle lamps and auto-folding wing mirrors. However, it misses out on a sunroof which both its rivals offer. The Compass Limited Plus goes a step further and gets a proper dual-pane sunroof. It even gets dual-zone climate control, express up/down front power windows and express down rear power windows, along with an electronic parking brake and powered driver’s seat with two memory settings. The Creta fights back with ventilated seats in the newly introduced top-spec SX (O) Executive variant, powered driver’s seat and a wireless phone charger. When it comes to offering a rich experience, though, the Compass has its rivals beat. Be it the soft touch dashboard, the quality of fitment or upholstery, the Compass pleases the cutaneous senses much better. The Harrier makes you feel more special than the Creta, simply because it’s bigger and more importantly, newer here. The Creta is now a four-year old car, so while the quality and consistency in fitment leaves little to be desired, there’s nothing to make you go wow either. The Creta’s sound system also feels meeker in this company. The 6-speaker sound system does a decent enough job, but the Compass gets a superior quality 6-speaker setup and even super loud music rarely gets distorted. But the Harrier flexes its muscles hard with a 9-speaker sound system that’s louder than the others, while the sound quality is great as well. Notably, the Compass (8.4-inch) and Harrier (8.8-inch) also have bigger touchscreens than the Creta (7-inch) in their top-spec models, but they do occasionally throw up some bugs or have some lag, which hasn’t been an issue in the Creta. Now, we play a little game! Why is this bit named so? Well, each car either has some features misses, interior glitches or both. The Harrier, for example, misses out on an auto-dimming IRVM, driver vanity mirror, height-adjustable seatbelts, powered driver’s seat or a sunroof. The glitches? Well, we love big wing mirrors but within reason. Because the window line of the Harrier is raised, these wing mirrors sit higher than they ought to, creating alarmingly large blind spots, so it’s easy to not spot a biker in traffic. This also creates issues in finding the right driving position, especially for shorter drivers, since your position has to focus on just getting visibility right before you consider comfort. Amplifying the issue is the footwell, which just doesn’t leave you any space to actually use the dead pedal and then there’s the centre console which fouls with your knee every time you change gears. The Compass has a similar issue in the pedal box and drivers with big feet will find the clutch too close to the dead pedal. Also, why Jeep didn’t add cruise control with the Limited Plus is inexplicable. In a car that is such a capable highway tourer and can cost over Rs 25 lakh on road, you’re giving buyers blank switches and in such an obvious spot at that? Seems almost cheeky. The Creta too, misses out on features like auto headlamps, auto wipers or telescopic steering adjustment, which you would expect at this price, while the manual variants can’t have ISOFIX. But that aside, the Creta has no real cabin glitches. All the controls are exactly where you’d expect them, the footwell has ample space to rest your foot and there’s no learning process to get accustomed to its driving position, irrespective of your height. And that pays serious dividends once you get moving. In the city, the Creta is simply the easiest to drive. Not only do its compact proportions make manoeuvring easy, the controls are the easiest to use and the most intuitive. The clutch is light, the gear lever is sure slotting and the steering is perfectly calibrated no matter the speed. It’s powered by the smallest engine here, a 1.6-litre, 4 cylinder diesel good for 128PS and 260Nm of torque and like the others, gets a 6-speed manual gearbox. This powertrain has a good reputation for driveability in any scenario, with ample low-rev torque for easy city drives. Turbo lag is also not nearly as noticeable as it is in the other two. 40kmph in 4th gear? No problem, the engine can take a strong amount of strain before it shows signs of knocking. A simple difference you notice in the Creta is that you don’t feel the need to hover your left foot near the clutch as much as you do in the other two. Even if you upshift a little too early, the powertrain shows but a little protest before pulling itself to an appropriate speed. It’s more comfortable with low speed-high gear combinations. Not to forget, the petite Creta is grande when it comes to fuel efficiency in this company. Delivering nearly 14kmpl in our tests, the smaller, lighter and subsequently more frugal Creta is kinder to your pocket for daily drives. The Harrier does well in the city too, better than the Hexa even. The clutch is surprisingly light as is the steering. Even the engine offers loads of low-rev torque, but there is some noticeable lag. Upshift a little too early and you can hit engine knock quite easily. In fact, on one of the hairpin bends leading up to Lavasa in Pune, we took the Harrier up in 2nd gear and it managed to stall. Something neither one of the other cars did in the same gear, on the same hairpin at the same time (we were travelling in a convoy with a one-car distance between us). This means that you will be a little more wary of early upshifts in the Harrier compared to the Creta. And of course, there’s the size. The Harrier looks and feels its size, so narrow roads or bikers getting too close will get you nervous. The size also means that tight junctions will often need three-point U-turns and not every parking spot on the street is for you. The Harrier delivered 11.29kmpl in our city FE test which is noticeably less than the Creta, but acceptable for an SUV this big and heavy. The Compass shares its powertrain with the Harrier i.e. a 2.0-litre, 4-cylinder diesel with a 6-speed manual gearbox. However, while the Compass makes the same 350Nm of torque, it makes more power - 173PS vs the Harrier’s 140PS. Driveability is similar for the most part and it too had some turbo lag. The difference lies in the how the boost kicks in. The Harrier’s turbo spool gives you a linear surge of power, even in Sport mode, while the Compass gives you a spike. As such, the Harrier’s low-speed performance is a little more forgiving for newer drivers. In comparison, driving the Compass needs some getting used to. Otherwise, the Compass has just one issue that gets in the way of city usability. The clutch in the Compass makes it a footfull to drive in the city. It’s old school SUV like, in that the pedal is quite heavy and has a long travel range, so it’s no joy in bumper to bumper traffic. The ride in the Compass is also not as good as the other two at low speeds and feels stiffer. Over Pune’s infamous table top speed breakers, for example, you feel the bumps more here, than you would in the Harrier or Creta. Where the Compass comes into its own is when you’re out on the highway. The performance is explosive and exciting. Taking a hair over 10 seconds, it’s the quickest in our 0-100kmph test and even the in-gear acceleration figures are closely matched to the Harrier’s. While that’s impressive for the Harrier, considering it’s a heavier car that’s down on power in comparison, the Compass wins your heart with its stability and precise steering. Quick lane swaps on the highway or hard corners, the Compass eggs you on to push harder and is certainly the enthusiast’s pick here. The Harrier is also an excellent highway tourer and rockets past 120kmph with ease. But there is more body roll, so through corners/ghats, you can easily find yourself sliding in your seat if you get ambitious with your turn-in speed. Additionally, the steering calibration is inconsistent. There’s some dead play from the dead centre to 1’o’clock or 11’o’clock positions, beyond which, the steering servo gets suddenly amplified and gives you a stronger turn in than you’d expect. While the Harrier is only too happy to munch miles, it behaves exactly how you’d expect something this big and tall to when you’re looking to go lock-to-lock. The Creta manages to do a decent job on all fronts. Drive the Compass, Harrier and then this, and you will find that it behaves very much like a sedan through corners, staying absolutely flat and precise. The smaller size also makes it feel so much more agile than its big SUV counterparts and easier to operate controls just make the deal sweeter. What it also retains on the highway is its relatively frugal nature, proving itself as the lightest sipper on the open roads as well, and by quite a margin at that. What it lacks on the highway is that extra bit of punch that the other two offer. The in-gear acceleration is slower, so while this has no issues as a tourer or something you can drive fast, the Harrier and Compass just have more to offer. When it comes to ride quality, it’s a bit of a mixed bag. On smooth roads, all three feel compliant giving you no reason to complain. But, over speed breakers, the Creta and Harrier do better than the Compass, providing better cushioning. Over gravelled and badly potholed roads though, the Creta doesn't feel as robust as the other two that insulate you better. Yes, in the Harrier or Compass you can hear the suspension thunk at times, but at most, you feel some vertical bobbing. In the Creta, you do get tossed from side to side a fair bit, so it doesn’t feel as punishment friendly. One solution is to drive quickly, so it doesn’t dive through each inconsistency, but that will take its toll on the suspension and tyres. To keep you protected, all these SUVs pack in a healthy list of safety tech, but again, with some strange application. The Harrier only offers ISOFIX in the top-spec XZ, the Creta only with the automatic variants and while the Compass does offer six airbags like the other two, it’s only with the 4x4 versions. Let’s begin with the Harrier vs Creta argument. In this company, the Creta is simply the easiest to use everyday. Its smaller size, considerably better ergonomics, lighter controls, superior fuel efficiency and the fact that you can have it with a petrol or diesel, manual or automatic, give it a strong upper hand as a city car. It’s also a great pick for highway road trips. But the Harrier simply pummels it when it comes to road presence, cabin space and practicality. In these aspects, it feels like the Harrier is from two segments above. The Harrier is also a more rugged SUV and feels tougher through the rough stuff. Importantly, the Harrier does give you more value/more car for your money, especially when you compare the mid-range variants. At Rs 13.36 lakh - Rs 15.63 lakh for the Creta vs Rs 12.69 lakh - Rs 16.25 lakh (all prices ex-showroom Delhi) for the Harrier, the final pick boils down to your preference. If you want a proper SUV experience for Creta money and are okay with the quirks that come with it, by all means get the Harrier. But if you want more features at a slightly lower price and prefer something that’s less of a handful in space-starved cities, the Creta makes for a great choice. And speaking of value, it’s where the Harrier does serious damage to the Jeep Compass. The top-spec Harrier costs less than the base Compass Sport diesel and it's nearly Rs 5 lakh less than the top-spec 4x2 Limited Plus. Yes, the Compass feels richer inside, handles better, is punchier on the highway and gets the option of 4x4 (something Tata will offer at a later stage) too. But at Rs 16.60 lakh - Rs 22.90 lakh (ex-showroom Delhi), it prices itself out of the value for money paradigm and is largely about desirability, attributed in no small part to the Jeep branding. It simply does not justify THAT big a price premium. The Harrier delivers a lot of what the Compass does and then adds its own selling points to top. So, in conclusion, the Tata Harrier may not be the perfect balance between the Creta and Compass, but it’s a bloody good one. It is good to see the improvement of Tata motors in all aspects like the harrier but it is very poor and not up to the mark in terms service of the same from Tata. This is the point I am hesitate to buy this vehicle. It is good to see the improvement of Tata motors in all aspects like the harrier but it is very poor and not up to the mark in terms service of the same from Tata. This is the point I am hesitate to buy this vehicle.